I think it is time to catch you up on what has been going on over at Lucky lately. To do that, I probably better explain what our plans are with the house. Lucky is a traditional foursquare house; fours rooms on the main level and four bedrooms upstairs. The house originally did not have an indoor bathroom. 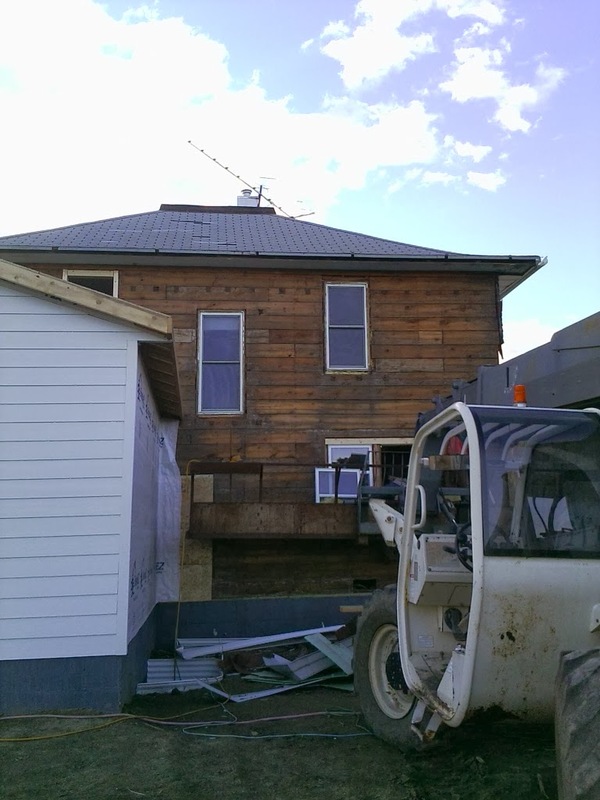 The bathroom addition was added around the sixty's and we ripped it off before moving the house. We are building two addtitons onto the house. The biggest addition is an 18x24 foot space that will have a bathroom, pantry, laundry space and the stairs to the basement. It will also be connected to the garage, so it will be sort of a breezeway between the garage and the original house. The exterior has been framed and the basement stairs are complete and the interior walls are framed in. It is partially covered in housewrap, and awaiting siding. The second addition is a 16x16 space that will be a main level master someday. The Hubs really wanted a master bedrooms space created now, so that the foundation would all be done and we wouldn't have to add on for it later. With the kiddos being so little though, we won't need the main level master for several years, since we'll be sleeping in an upstairs bedroom. The new addition will be a playroom/family room for now and I am loving the idea of a space to stuff all the kids' things and be able to close off the mess! This addition already has two sides covered in siding! I have been working on interior projects in the existing house, but it is getting harder to do work since we don't have heat yet or elctricity directly to the house. The water has been run to the house and the electric transformer is there so we can run extension cords to run power tools, etc. The carpenters took a day and helped me pull up the plywood that was underneath the tiles that I took out of the kitchen, under that we found a layer of sheet laminate and under that is vinyl tile with a tar backing, but under that is the original hardwood floors in salvagable condition! I was so excited to see that we could save the hardwood, we were concerned that because the plywood had been screwed directly into the wood floors that the wood would be split, but thankfully it wasn't! I have to get through the two layers before the hardwood is exposed, but I am so happy that the hardwood is there that it makes it all worthwhile! It has been a slow process, and since we don't know for sure whether the tiles contain asbestos, but there is a high probability, I have been taking precautions, like wearing my Darth Vader, asbestos rated mask. Therefore the kiddos can't be over there with me, and getting a day without them doesn't happen very often. I have heard that using hot, nearly boiling, water and a scraper is the best and safest route for getting the tar off the floors, so as soon as I get a day without kiddos, I'm going to try that. Not sure how I'm going to get hot water there, but I'll figure something out. We are waiting on windows for the basement, and addition, electric hookups, heating, plumbing, and the tin for the new roofs to arrive. Then we'll be in business! Ha, it's sounds so much worse when I put it in a list! The good news is, that so far we are still on budget and when they stripped the old siding off the original house, the exterior of the home was still is good condition! A little reframing was done around some windows that had rotted from leaks over the years, but no major damage. I am happy with the progress so far and can't wait to see what is next! Today I am thankful to all the veterans that have served and to those still serving that make it possible for someone like me to be able to follow my dreams. Thank you, I truly appreciate the sacrifices you have made. P.S. This is what it looks like now. The dark wood is the original house, stripped back to the basics and the white siding is the smaller addition! P.P.S. Check out the rest of my thankful days for November here!